As the UK's statutory regulator of architects, one of the key responsibilities given to us by the 1997 Architects Act is to maintain and publish a Register of Architects. Under this statutory function, the UK Register of Architects is the only officially recognised listing of every UK registered architect. There are certainly other publications in the market, particularly so in an age where information is just a couple of clicks away on the internet. But the danger in relying on these other unofficial sources lies in members of the public potentially using someone for a building project who doesn't have the skills, knowledge or experience that a genuine architect has acquired on their journey to registering with ARB. Throughout 2011 and into 2012 and beyond, we have been and will continue to devote resources to raising the profile of the Register, given that it is a valuable resource for anyone who might be looking for an architect. An online, searchable Register has been a feature of our website for many years now but to further enhance its value, we have been developing its accessibility to make it even easier for members of the public either to find an architect or to check whether someone is registered. Not only that, but we are giving every architect their own webpage where they can add their telephone number, email and website address so that their clients and potential clients can contact them direct. And when they use the Register to find an architect, consumers can be confident that every entry guarantees that that person is a qualified, competent professional with the requisite skills to manage a building project, from inception through to completion. This makes our Register a very public recognition of an architect's professionalism and the ultimate reference source for anyone looking for an architect. We are keen to ensure that we continue to raise the profile of the Register, and our aim is to make it the first port of call for anyone who is either looking to find an architect or to check whether someone is registered. Architects themselves have a part to play in this. As well as including their contact details on their personal ARB webpage, they can also create a link to this from their own website. Not only will this underline an architect's registered status, it will also have the effect of pushing the Register further up the list of rankings on internet search sites. 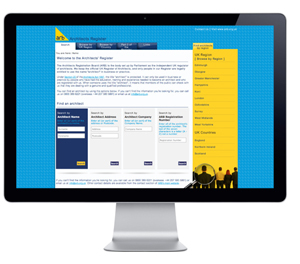 The enhanced Register has a twofold benefit: the public can be confident that they will be using a genuine, ARB-registered architect for their project, rather than an unregistered and possibly unqualified individual masquerading as an architect, and the profession will benefit because of an increased awareness among consumers of the benefit to them of using a fully qualified and regulated professional. In tandem with our work on enhancing the online Register, 2011 also saw us make great strides towards improving the online services we offer to architects. Much of this work arose from our ongoing efficiency drive and the move away from costly paper-based systems to the more cost-effective and versatile electronic systems. We had to look for new and improved ways of streamlining, both to offer value for money and to provide a service that was quick, easy and safe to use. We first developed a system for paying the annual retention fee online. The numbers using this service have gradually increased, in part because we have been reminding architects that this facility is available, but also in part because architects are finding that it is quickest and most convenient way to pay their fee. With the online payment system firmly embedded, we turned our attention to other areas that we felt could be improved using the technology available to us. We developed an online system for architects to update their own contact details, both so that our records held the most up to date information, and to enhance their personal ARB webpage to create communication channels through which potential clients could contact them. We continue to look for ways that this can be improved. We then began to look at whether it was viable to create an online registration system, not just for newly-qualified architects to join the Register, but also for anyone who may have been off the Register for whatever reason, and now wanted to rejoin. This was an incredibly challenging and time-consuming project as it had to fulfil a number of criteria, not least that it had to be straightforward to use, it had to meet our statutory responsibilities for registering individuals, and it had to be fit for purpose. Each individual step in the online registration process underwent intensive testing to ensure that all the development criteria were met. We were aiming for a system that was responsive to its users' needs, where applicants could upload their supporting information rather than having to send it through the post, and allowed applicants to pick up their application where they left off if they needed to take a break. Online registration will go live in 2012 and will give architects an online registration system that is secure, straightforward, convenient and easy to use. Late in 2011, the Board considered responses to a public consultation on changes to the Procedures for Prescribed Examination. Revised guidelines and application documents were subsequently drawn up and published on our website. Align the Examination with the revised prescription criteria for 2011, which were agreed in common with RIBA and the Quality Assurance Agency (QAA). Make the application process more straightforward to understand: suggestions and advice from candidates, examiners and other stakeholders has been used to drive these changes. A more structured approach for mapping evidence to the criteria has been developed, giving more consistency in line ARB's expectations. Apply the English Language requirement more universally: EU candidates were not previously covered by this, but in future, a valid International English Language Testing System (IELTS) certificate may be required where English is not the candidate's first language. Clarify the purpose of the Prescribed Examination through revised eligibility requirements: qualifications must be principally concerned with architecture to meet obligations under the Qualifications Directive, and the Examination is not an alternative to securing qualifications with the required curriculum in architectural design. Provide enhanced feedback for unsuccessful candidates: examiners may now give feedback verbally to candidates who have not met the required criteria, using the session normally set aside for interview. Please note this figure will differ from the Register due to the prepayment and credit balances.